Watercolour of Chandni Chowk in Delhi from 'Views by Seeta Ram from Delhi to Tughlikabad Vol. VII' produced for Lord Moira, afterwards the Marquess of Hastings, by Sita Ram between 1814-15. Marquess of Hastings, the Governor-General of Bengal and the Commander-in-Chief (r. 1813-23), was accompanied by artist Sita Ram (flourished c.1810-22) to illustrate his journey from Calcutta to Delhi between 1814-15. 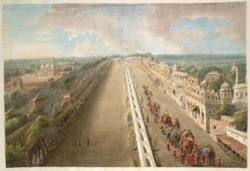 Idealised view of the Chandni Chowk from the top of the Lahore Gate of the Fort, the canal depicted running down the middle, with the Jami' Masjid immediately (and wrongly) adjacent to the south, and with Lady Loudoun's procession of elephants heading along the street. Inscribed below: 'Great Choke at Delhi.' .